Energy shortages are hobbling the economy and contributing to unrest. But the country has options. Pakistan is in the midst of one of the worst energy crises in its history. This is both slowing the pace of economic activity and causing public unrest with prolonged outages of electricity and gas. Capacity utilization in some key industries has fallen to nearly 50 percent. Worst affected is the fertilizer industry, which faces interruptions to its gas supply and forced closures. Pakistan has the capacity to produce more than one million tons in exportable surplus urea, yet in 2011-12 it imported more than 1.1 million tons. This eroded the country’s foreign exchange reserves and effectively entailed the payment of millions of dollars in subsidies, being the difference between the cost of locally produced and imported urea. Pakistan urgently needs to make some strategic decisions and change the national energy mix. Immediately after assuming power, the government of Nawaz Sharif came up with two policy decisions: pay half a trillion rupees (just under $5 billion) to energy companies and announce a new power policy. Both steps are aimed at resolving problems plaguing the companies belonging to the energy chain and bringing change to Pakistan’s energy mix to optimize the average cost of electricity generation. Pakistan’s government paid Rs260 billion in cash to independent power plants (IPPs) to clear outstanding debt. It also issued bonds to pay off liabilities pertaining to state-owned companies such as exploration and production firms and oil and gas marketing entities. After clearing the debt of the IPPs, it was expected that they would be able to generate 1,700MW in additional electricity, attenuating the shortfall that currently exceeds 6,000MW. The situation is likely to improve over time. According to the available data, at present installed power generation capacity in Pakistan is estimated to about 22,500MW (excluding the Karachi Energy Supply Company, more on which below), but actual power generation hovers around 15,000MW, partly because of outdated and inefficient power plants and partly because of a cash crunch, which often does not permit power plants to operate at optimum capacity because of the inability to buy the required furnace oil. This could be best understood when one looks at the available data on power plants operating in the public sector, which have an installed capacity of over 4,800MW but actual generation hovering around 1,200MW. At present, the bulk of electricity supply comes from hydroelectric plants (6,500MW) and IPPs (6,500MW). The output of the hydro plants is dependent on water availability in the dams, and can fall to as low as 2,500MW when water levels drop drastically. And as we have seen, IPP output is limited by money problems. Pakistan’s woes have been exacerbated by its excessive reliance on thermal power plants, mainly using furnace oil. Two factors contributed to the emergence of this situation: a change in lenders from the public to private sector, and Pakistan’s failure to complete a hydroelectric project in recent decades. 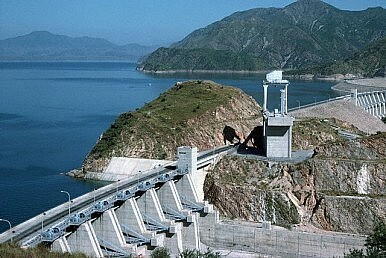 The last mega dam, Tarbella, was completed in the mid seventies and no other dam has been constructed since. After the signing of the Indus Water Treaty with India, Pakistan was required to complete construction of one mega-size hydroelectricity plant per decade to ensure year-round availability of low cost electricity and irrigation water. Unlike the rest of Pakistan, Karachi gets its electricity from a compact utility, Karachi Electric Supply Company (KESC), which handles generation, transmission and distribution. The bulk of its generation comes from the Bin Qasim Power Plant, which has an installed capacity of 1,260MW. Another 500MW comes from smaller units. Since privatization, KESC has added another 500WM capacity at Bin Qasim but its output has remained erratic because of the inconsistent supply of gas.